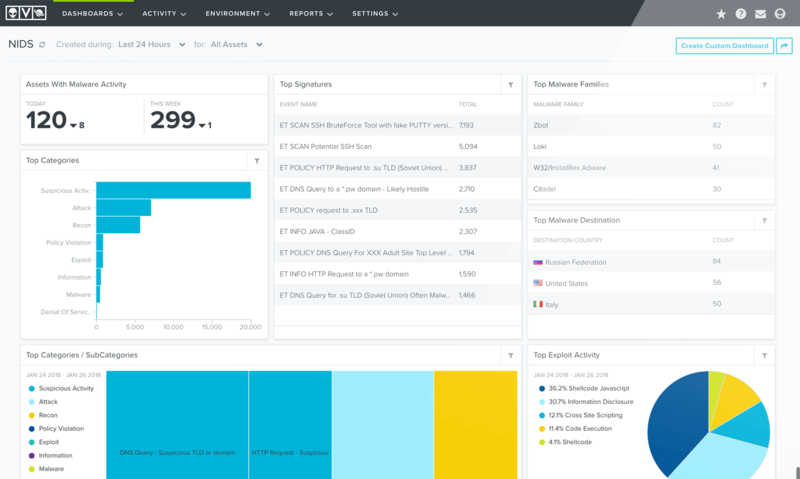 AlienVault is well suited for monitoring environments especially standard Linux environments and is great at generating non-technical reports. The standard user interface allows non-technical individuals to navigate the system and generates clean looking easy to understand reports. The system is not as well suited for Windows environments or any non-standard configurations such as integrating custom software/scripts is very challenging. File integrity monitoring on Windows has been very frustrating. Very well suited for reporting, and identifying control failures. I can single handedly do the analysis work of an entire remediation team - validate my findings - export the information in a format that is friendly to pass along to my admins - track remediation efforts - and update documentation in one interface.There are some areas in the reporting that could be tweaked a bit to provide more nimble output. FireMon has a wide variety of pre-generated reports that have a lot of value over the query based reporting. Many of those reports you can run against your entire enterprise, but some you can't....meaning you might have to duplicate the report for a handful of devices depending on your need. The integrations are very end-user friendly. The user interface is fairly intuitive. The PCI reports are extremely time-saving. The cross-platform compatibility makes hybrid environment management much easier. Security Manager provides a graphical map of your infrastructure and allows you to do a path analysis through the firewall infrastructure. Security Manager allows you to view every change made on the specified device. This includes the day, date, time, and user who made the change. You can drill down to detailed information concerning exactly what the change was. Security Manager allows you to view all firewall policies including Security Rules, Objects, NAT Rules and more. Vulnerability Scanner reporting: The reporting from the integrated scanner (OpenVAS) are really difficult to read. They could have done a better job by scraping the report or creating a custom report from the data of the scan. However, leaving the default report template from OpenVAS makes the report somewhat useless. Sometimes the local integration fails because of the scope of the tool. Let me elaborate on that: The OpenVAS scanner has certificated that expire within a year, and that makes the USM fail scans if you don't renew certificates yourself. They should have made them last at least 10 years. Same with Nagios, sometimes the integration fails and one doesn't know why unless you jailbreak it and find out in the logs for sure. They do not provide a standalone installation of the product, because they modified so much the Linux distribution, that it must always be deployed as a virtual machine or appliance, but not on your own server. There needs to be functionality to roll back changes to FireMon, or save copies of firewall documentation that can be reverted back. There are some manual fields you can fill in for firewall rules in FireMon (things such as notes about audits of the rules, when they were last audited, etc). If they are removed, there is no way to re-add them. There also needs to be an option to copy documentation from one firewall to another in case you have to RMA a firewall. I have been advised that the development team is adding these features sometime in the next year, but it has bit us a few times. I get the impression that the development team needs to give better documentation to the support team. No root access to the box. This has caused some issues such as not being able to eject a CD rom from a VM and not being able to install a backup client requiring us to code a backup script in house. There used to be sudo access, but it was removed. No need to renew our use. We are actively using and liking it. Future outlook is continued use of the USM platform and tailoring it more and more for our environment. We use the tool frequently and it is integrated into our processes. We have been using AlienVault USM Appliance for nearly 3 years. The power and flexibility of the device for IPS and IDS is amazing. We are able to identify threats and stop them before damage can be done. For the most part, using the tool is straight forward. Some of the menus could use some work on usability. I find their support to be excellent. From the FAQ's to the tech docs, it is very easy to resolve most issues. The few times we worked with a support technician, they were always quick to resolve our issue. We are very pleased with the overall level of support! We find the features useful in our environment. Anything beyond a vanilla deployment will take a lot of effort. Implementation is fairly simple. Most issues can be resolved by referencing manuals. AlienVault USM works well for any company size. LogRhythm might be too much if your company is not already big, and the same can be said of McAfee Enterprise Security Manager. If this is your first SIEM, it's a really good choice and has nothing to envy from the others I'm comparing it with. I also recommend the cloud version of AlienVault, the USM Anywhere, which the interface is a bit different, but the principles remain the same. Also, the McAfee Enterprise Security Manager has a Flash-based interface, for which Adobe is phasing out. AlienVault USM is HTML5 and can even be used mobile. I already had experience with the Tufin and AlgoSec products, and the customization that FireMon provides is just not available with the other products. The licensing of FireMon over AlgoSec is another winner for us. I am in an organization that spans over all continents, and this product enables me to create data collectors close to the assets without compromising effectiveness. It helps streamline our firewall management.